The most versatile, compact and portable media playback center on the market - with special branded version pre-loaded with Chuck D's SLAMjamz & Public Enemy's music and videos. MediaStreet Inc. (http://MediaStreet.com), a leading independent manufacturer of innovative digital solutions for the photographic, music, arts and consumer electronics industries, has introduced one of the most innovative, versatile and compact media players available on the market. The new eMotion (PMP-DVD) Portable Media Player DVD serves as a complete mini Media Center for watching movies, listening to music and viewing your favorite photos on-the-go. The new portable media player, with its super-compact, lightweight design, makes it easy and convenient to transport for use on planes, in the car, at home or in the office. The unit's numerous features and functions center around its built-in, 3.5-inch flip-open TFT LCD screen. The aesthetic design and ergonomic form of being able to comfortably hold the player in the palm of your hand adds a personal touch of viewing and enjoying your movies, music and photographs. "We wanted to produce an attractive, compact and robust portable entertainment center that you can use for all of your viewing and listening needs wherever you may be," said Norm Levy, President of MediaStreet, Inc. "eMotion allows users to watch DVDs, listen to music, and share photos without the need to be tethered to wires or lugging around heavy laptops or electronics. We believe this all-in-one media playback center will revolutionize how consumers watch and listen to entertainment at home, in the office or on the road," Mr. Levy added. Chuck D, founder of SLAMjamz Records, and head of legendary Hip Hop group Public Enemy appreciates the form and functionality of the eMotion PMP so much that a special branded version of the player will hit the streets 2nd Quarter 2007. Pre-loaded with SLAMjamz/Public Enemy catalog of music and music videos. "The SLAMjamz PE-PMP is the ultimate cross-over player that allows our fans to enjoy their existing library of CDs and DVS as well todays most popular digital files formats. Celebrating Public Enemy's 20th year anniversary of making music that makes a difference and makes an impact, our collaboration with MediaStreet is a perfect match with parallel ambitions." shares Chuck D at the SLAMjamz studio while recording PE's Anniversary album. The eMotion PMP DVD player can playback virtually every format media disc available including CD, DVD, VCD, CD-R and DVD-R. eMotion is also capable of playing back MP3 and WMA music files as well as DivX and MPEG4 video files for greater flexibility and versatility. The unit has a built-in 3-in-1 card reader fro SD, MMC and MS memory cards. In addition to the media card slots, eMotion also includes a USB 2.0 port for easy connection to USB hard drives, digital cameras and media card readers, adding even greater flexibility to the media player's capabilities. The media player's rechargeable Lithium-Ion battery provides over 2-1/2 hours of power, which is more than sufficient to view a standard-length motion picture. For longer trips, especially by car, the eMotion media player kit includes a DC Car Adapter for endless enjoyment while on the road. Accessories for the eMotion media player include a rugged carrying case, AC adapter, car adaptor as well as a remote control. The eMotion PMP DVD is available in Blue, Red & Silver. The SLAMjamz PE-PMP by MediaStreet is available in black. MediaStreet.comMediaStreet developes and manufactures digital convergence "eMotion Electronics". MediaStreet is also home of Beyond.FM where you will find content to be played on your eMotion Player. 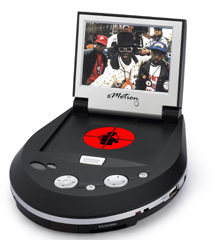 PE PMP DVD by MediaStreetChuck D's SLAMjamz branded Portable Media Player DVD. Comes preloaded with SLAMjamz catalog of music and videos.